The death of Her Majesty Queen Victoria early in the year cast a deep gloom over every branch of sport, and by none was it more sincerely mourned than by yachtsmen, to whose pastime she had for so long extended her gentle patronage. 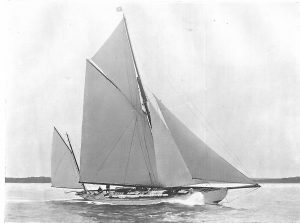 Sir Thomas Lipton again challenged for the America Cup in 1900, and commissioned Mr. G. L. Watson to design his new vessel, which he named Shamrock II. Her trial sailing with Shamrock I. in this country was not by any means reassuring. The older boat proved to be the faster vessel, particularly in fresh breezes and lumpy water. The new vessel was dismasted on the Solent when King Edward was on board. However, nobody was hurt. On the American side a precisely similar state of things occurred. Not only did the new defender, Constitution, lose her mast, but she also proved a less reliable vessel than Columbia. 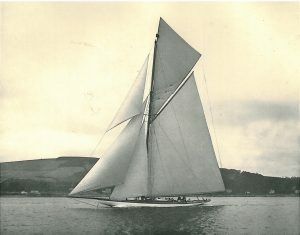 Racing at home began with a regatta on the Clyde, promoted by the Glasgow International Exhibition, when Shamrock I, Meteor, Sybarita, and Kariad met. The latter was a cutter of 93 rating, designed by Mr. G. L. Watson for Mr. Kenneth M. Clark. The racing was quite unreliable on both days, but when there was any wind Shamrock showed astonishing speed. Her time allowance to the others was, however, prohibitive – 42 minutes 34 seconds to Sybarita, to Meteor 45 minutes 37 seconds, and to Kariad 47 minutes 40 seconds, on a course of 47 miles. Sybarita won on the first day and Kariad on the second, Shamrock winning a special prize for the yacht first home. Sybarita and Kariad sailed a private match for £500 round Ailsa Craig from Rothesay. There was a strong breeze, and both vessels had two reefs down, and were pressed very hard. Sybaritawon the race by about 2 minutes over her time, leading Kariad home by 10 minutes 37 seconds. It was a remarkable display of speed, for the breeze gave a free reach out, with a short beat round the Craig and a close reach home. Meteor defeated Kariad at the Royal Northern Regatta, and Shamrock I also beat her in a private match at the Royal Western Regatta. The first-class yachts now broke up, Meteor returning to Germany and Sybarita going into the sale-list. The two Shamrocks sailed a few further trials on the Clyde prior to the challenger’s departure, and from these it appeared that Shamrock II had been somewhat improved. On the other side, after great indecision, it was finally deemed safer to select Columbia instead of the new yacht, Constitution, to defend the Cup. 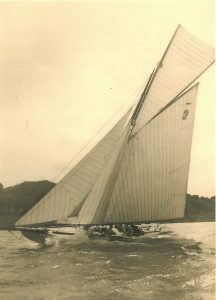 The first race was sailed on September 28 in a light wind, and Shamrock led to the weather-mark, having made a gain of 39 seconds in the 15 miles. On the run home, in a lightening wind, Columbia got past, and finished 37 seconds ahead, winning by 1 minute 20 seconds, corrected time. The second race was sailed on October 3 in a north-east wind of 12 knots strength. Shamrock was beaten by 3 minutes 35 seconds. The race showed Columbia to be the faster vessel both reaching and on the wind. The last race was sailed on October 4 in a moderate breeze, steady at first and fluky afterwards. Shamrock ran to the lee-mark faster than Columbia, and gained 49 seconds, but lost on the wind. Her handling was severely criticized, and there is little doubt that she would have won these Cup races if she had been (1) carefully tuned up at home, and (2) handled as well as the defender. She lost the last race by 41 seconds, Columbia crossing the lee end of the winning line 2 seconds after she had crossed the weather end. Only one new yacht, Nevada, was built this season for the 65-foot class. She was designed for Mr. P. M. Inglis by Mr. C. Herreshoff, a nephew of the famous American designer. Her only opponent was Tutty (Mr. W. C. S. Connell) which proved too good for her. Nevada was a very lightly built and short craft, of very small displacement. She showed great speed in light weather. Magdalen, 52-footer. Designed by Mr. W. Fife, Jun., in 1902 for Baron de Forest. The 52-foot class consisted of three vessels, all new craft. Gauntlet and Balœna had been designed by A. E. Payne for Mr. W. P. Burton and Mr. Andrew Coats respectively, while Magdalen was designed by Fife for Baron de Forest. Gauntlet and Magdalen were de­signed under the new rating rule, while Balœna had been built in the previous year, but not launched, owing to the absence of her owner in South Africa. Gauntlet and Magdalen were opposed to each other in the opening matches of the season, all of which were won by the Fife boat. Gauntlet did not go north to the Clyde, but Balœna opened her racing there. She did not, however, fare much better than Gauntlet had done earlier in the season, and had a stern chase almost every day. Magdalen’s first defeat was at the Royal Northern Regatta, when she lost some ten minutes in picking up a man who had fallen overboard in a hard breeze. The three met in the Solent, and then continued their racing at the Western regattas. Magdalen was, however, almost invincible, and in forty-two starts scored thirty-eight wins. Magdalen had been selected by the Royal Temple Yacht Club to defend the Coupe de France against the Duc Decazes, who challenged with Quand Meme. She turned out to be slightly over 20 tons, French measurement, however, and the Cup was resigned without a contest. The Duc Decazes, nevertheless, brought his yacht over to sail some private matches with Magdalen at Weymouth in the end of August, with the result that Magdalen showed a pronounced superiority. Sorais II. Mrs. H. Allen. 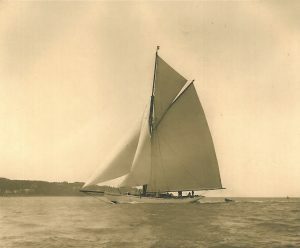 Captain J. Orr-Ewing had a new 36-footer, named D, built for him by Mr. C. Sibbick in the early part of the season, but after a little racing he ordered another, named Piccolo, from Messrs. Fife and Son, and this boat was very successful. Cuckoo (Miss Cust) was also built by Sibbick, and she proved a fast little vessel. Girleen (Mr. J. Gretton, jun.) and L’ Allegra made up an excellent class. The 30-foot class was composed of Sorais, Mrs. Allen; Petrel, Colonel Clifton Browne; and Mayfly, Mr. H. Jefferson. Sorais, designed and built by Mr. Harley Mead, proved a remarkably fast little craft. 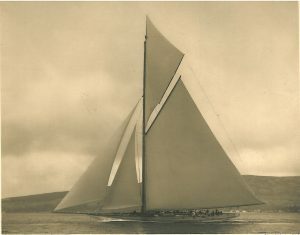 Phalarope (Captain R. T. Dixon) was a very successful boat in the 24-foot class. There was a considerable amount of handicap racing through­out the season, which took the place of full entries in the open classes. This year the German Emperor abandoned his yawl Meteor II. for a new schooner designed by the American draughts­man, A. Cary Smith. The vessel, which was named Meteor III measured 120 feet on the loadline, by 27 feet beam and 15 feet draught. 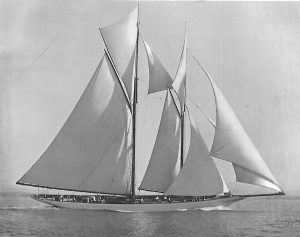 Mr. W. Fife also designed a new schooner, named Cicely, for Mr. Cecil Quentin, of 90 feet waterline, 23 feet beam, and 14 feet draught. Both vessels were intended to be ‘fast cruisers.’ Cicely first met Meteor III. in German waters, and it soon became apparent that the British vessel was much the superior of the two, particularly on the wind. On this point of sailing Cicely proved a truly remarkable vessel, and pointed wonderfully high for a schooner. 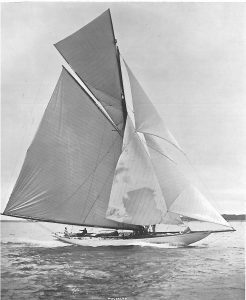 Racing in the open classes was practically dead, the only vessels in commission being two new 52-footers: Lucida, designed by Mr. W. Fife for Mr. W. P. Burton, and Camellia, designed by Mr. A. E. Payne for Mr. Andrew Coats. Vol-au-Vent was the winner, on time, of the cup presented by the German Emperor for a race from Dover to Heligoland. Cicely was scratch vessel, and had to allow Vol-au-Vent 5½ hours, and only led her in by 23 minutes. Kariad raced in a few handicap matches on the Thames, and then joined Bona in handicaps on the Clyde. 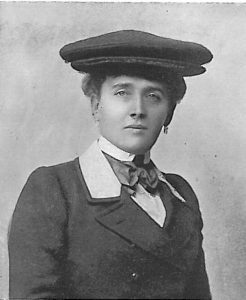 Tutty, sailing in splendid form, also sailed with her, and the racing was remarkably good. Sybarita, Kariad, and Carina raced for His Majesty’s Cup at the Royal Northern Regatta in paltry and wet weather, Kariad finishing over an hour ahead of Sybarita. Bona sailed for the south, and joined a large handicap class, composed of Cicely, Brynhild, Irex, Namara, Navahoe, Tutty, Clara, Creole, Columbine, and Susanne. At the Ostend Regatta, at the end of July, Cicely won in the first match, and Navahoe in the second and third. The Cowes Week brought little open racing, though a very large number of yachts appeared in handicaps. 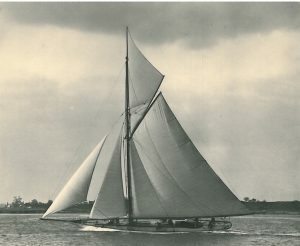 There were no less than twelve starters for His Majesty’s Cup in the Royal Yacht Squadron Regatta, and the trophy was won by Sir James Pender’s Brynhild, which finished ahead of Meteor and the rest of the fleet. Next day, in a strong southerly breeze, Meteor defeated Sybarita on Yacht Racing Association time allowance. On the same day no less than fifteen vessels started for the German Emperor’s Cup. This was a hard reaching match of 50 miles, and the fine old Irex won the prize on time – a truly remarkable display of speed. She finished only 16 minutes 21 seconds astern of the leader, Cicely, a vessel of three times her tonnage, and beat Namara by over 6 minutes – a wonderful feat for a vessel nineteen seasons old. The only 52-footers racing this year were Lucida and Camellia. The former proved the better boat, but Camellia was much improved by some alterations after the opening matches on the Thames, and the two boats sailed many excellent races. Nyama, a Fife-designed 36-footer (Captain J. Orr-Ewing), and Girleen, a Payne boat (Mr. J. Gretton), were closely matched. On the Clyde this class was represented by three new boats: Eileen(Mr. Sydney Mason), Ensay (Mr. J. Stewart Clark), both designed by Mr. W. Fife, and Barabel (Mr. Charles Maclver), the crack, by Mr. Alfred Mylne, now fast becoming famous. 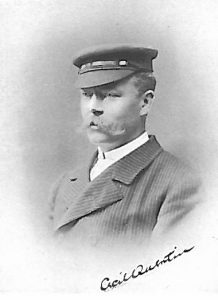 The death took place this year of Mr. William Fife, sen., whose name figures so honourably in the annals of British yachting. In the autumn of this year Sir Thomas Lipton again announced his intention of challenging for the America Cup, and com­missioned Mr. W. Fife to design the new vessel. Gauntlet, 32-Footer. Late owned by Mr. A. L. Pearse. 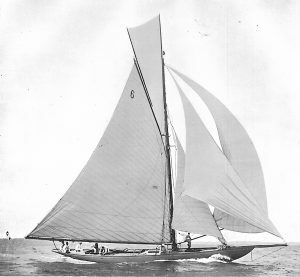 There were no first-class yachts in commission at the opening of the season, but a fine new cruising yawl, named Valdora, was designed by Mr. W. Fife for Mr. J. G. Douglas Kerr, and she joined the handicap class, in which Namara, Maid Marion, and Creole were the most noted entrants. A smaller handicap class, composed chiefly of ex 52-footers, supplied good sport. In this the follow­ing yachts usually sailed: Gauntlet (Mr. J. R. Payne), Senga (Mr. George Terrell), Viera (Messrs. F. and H. Last), and Morning Star (Mr. N. T. Kershaw). In addition to these, Nan, a smart little Fife-designed cruiser belonging to Messrs. Elder and Hall-Say, and Nebula, a cruiser designed by Mr. F. Shepherd, and owned by Mr. A. K. Stothert, also competed with considerable success. A new 52-footer, Moyana, was designed by Mr. Alfred Mylne for Mr. Leuchars, and another, Viola, was designed for Mr. W. B. Paget by Mr. C. Nicholson. These, with Camellia and Lucida, made up the 52-foot class. Meteor, Cicely, Clara, and Brynhild raced in the Royal Thames (handicap) match from the Nore to Dover, Brynhild (Sir James Pender) winning in very paltry weather. The same club had a day’s racing at Dover on June 16, but the weather was again very calm. 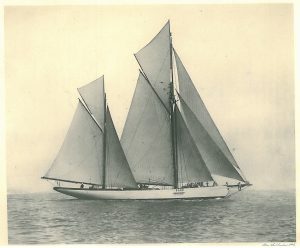 Adela, Schooner, 224 tons. Mr. Claud T. Cayley. new schooners – Adela, 235 tons, designed by Mr. W. C. Storey for Mr. Claud T. Cayley, and Evelyn, 236 tons, also designed by Mr. W. C. Storey for Mr. George Flett. The winner was the Marquis of Camden’s Fiona, yawl, 151 tons. Valdora, Bona, and Brynhild raced at Cork, Bona winning the King’s Cup presented to the Royal Munster Yacht Club. This was the sixth royal trophy won by Bona, and a similar feat had only been accomplished previously by Britannia, Egeria, and Fiona, although nearly 150 such prizes had up to that time been pre­sented by the Sovereign. The Royal Irish Regatta, which was fixed before the Clyde racing, proved quite a fiasco. The Clyde regattas this year were unusually tame, the only yachts of large size competing being. Bona and Valdora, which raced under handicap. Valdora proved herself to be a very smart vessel. The four 52-footers, however, rendered capital sport, and the prizes were well distributed. Moyana turned out to be a very smart craft, and. Viola was fast in light weather. In the 36-foot class, Barabel (Mr. Charles Maclver), Ensay (Mr. J. Stewart Clark), Eileen IV. (Mr. Sydney Mason), and Falcon (Messrs. Connell), made excellent racing. Meteor won His Majesty’s Cup at the Royal Yacht Squadron Regatta, Brynhild, Glory, Cariad (ketch, the Earl of Dunraven), Fiona (yawl, 151 tons), and Cetonia also competing. No fewer than seventeen vessels started in the Squadron race for the German Emperor’s Cup, Bona winning first prize, Cicely second, and Glory (Sir Seymour King) third. The last-named sailed remarkably well, and managed to lead the smart Brynhild all day. In the Solent the 36-foot class had died out, its chance of support being destroyed by a class of one-design boats of slightly larger size being instituted. Lord Albemarle was chiefly interested in inaugurating the class, in which there were six yachts: Harmony (the Earl of Albemarle and Lord Brassey), Jean (Mr. John Gretton), L’Amoureuse (Mr. Charteris), Heroine (Mr. Rivett Carnac), Caprice (Major Balfour and Mr. Jefferson), and Eileen (the Hon. A. Greville and Mr. B. Fitzgerald). The 30-foot class was reduced to Andrum (Captain J. Orr-Ewing), Sorais II (Mrs. Allen), and Tern (Colonel Clifton Brown). The former were both Fife boats, and Andrum was crack of the class. Duet (Miss Cox and Mrs. Schenley), Phalarope (Captain R. T. Dixon), and Campanula (Mr. Froude), composed the 24-foot class, and of these Duet was the most successful. In the early part of the season a considerable amount of trial-racing took place between Shamrock I and Shamrock III. The new vessel, which was of extremely taking appearance, was obviously much the faster of the two. She lost her mast at Weymouth in much the same way as Shamrock IItwo years before. Sir Thomas Lipton decided to take both yachts out to New York for the purpose of further trial-racing there, and in the course of these the older vessel seemed to improve in her form. The Americans had many trials between Columbia, Constitution, and Reliance, the new Herreshoff defender, and the last-named was finally selected. She was a vessel of very extreme type, being of somewhat pronounced scow-shape, and having a sail-spread of nearly 1,900 square feet more than that of Shamrock III. The first Cup race was sailed in a smart breeze on August 22, when Reliance won by 7 minutes 3 seconds. 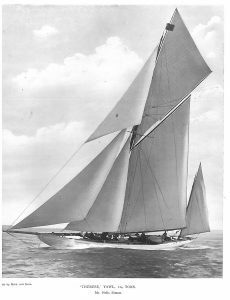 Some of her lead was due to a shift of wind, and Shamrock was handicapped by a badly setting mainsail; still, Reliance clearly showed greater speed off the wind. The second race was sailed on August 26, and Reliance won by 1 minute 19 seconds. The wind was light, and Shamrock made a poor start, crossing the line 19 seconds after the limit gun. She lost 49 seconds in the beat to the first mark, 15 seconds on the second leg, with a quartering wind, and sailed about level on the reach in. She would have been beaten by a minute only had she not lost time at the start, and might have saved her time if the breeze had held good to the finish. The third race was sailed on September 3 in a light wind, which freshened on the run home. Shamrock was badly beaten on the turn to windward, and as a thick fog came on in the run home she did not finish. The Cup, therefore, was successfully defended. The type of the two boats, however, differed vastly, and the American craft was of such design that it was universally recognized that it would be unwise to send any vessel of her type across the Atlantic. The death took place of the celebrated designer, Mr. Arthur E. Payne, on September 9. He was the designer of many very smart yachts, having draughted the lines of no less than 175 vessels. Of these, Sir Seymour King’s cruising yawl, Glory, was the largest, 205 tons. 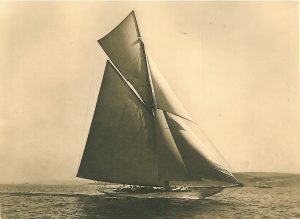 Mr. Payne ranked next to Mr. W. Fife among British designers of racing yachts. Unfortunately, he never obtained the opportunity of designing a first-class racing vessel, his largest work being for the 40-rater and 65-foot classes. Open racing was at a very low ebb this season, only two. new yachts of any importance having been built. 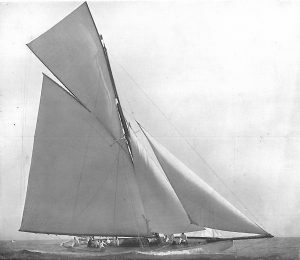 These were Zinita, 65-footer, designed by Mr. W. Fife for Messrs. Connell, and Maymon, 52-footer, by the same designer, and owned by Mr. S. Butler. The former found no opponent in her class, and was obliged to put up with handicap racing throughout the season. Maymon proved to be the best of the 52-foot class, which included Moyana, Lucida, Camellia, and, occasionally, Gauntlet. Moyana started in no less than thirty-eight matches, Maymon in thirty-four, and Lucida in thirty-six. The latter was unsuccessful in the early part of the season, but showed better form as it advanced. A very handsome new yawl of 147 tons, named White Heather, entered the large handicap class this year. She was designed by Mr. W. Fife for Mr. Myles B. Kennedy, and turned out to be a fast vessel, though at first she seemed somewhat tender. Bona, Brynhild, Clara, Valdora, and Merrymaid, were her principal opponents. The latter, a cutter of z o6 tons, was designed by Mr. C. Nicholson for Mr. T. A. Hardcastle. 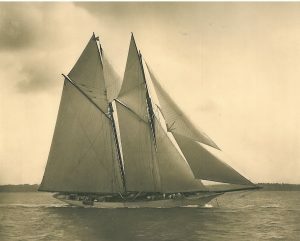 Ingomar, an American Herreshoff-designed schooner of 248 tons, belonging to Mr. M. F. Plant, visited this country and took part in the racing. She sailed in the Emperor’s Cup race from Dover to Heligoland, Valdora being the winner; but at the Kiel regattas she displayed great speed when racing with Hamburg (ex Rainbow) and Meteor, for both of which she was more than a match. Merrymaid . James E. Terry. The principal class at the Clyde regattas was formed of Bona, Zinita, Merrymaid, and Carina, and these were raced in handicaps. The Irish regattas were also very badly attended. Brynhild won the Squadron King’s Cup after a close race with both Meteor and Glory, this being the second year in succession in which she gained this prize. Creole won the German Emperor’s Cup next day, sailing in remarkable form against Ingomar, White Heather, Merrymaid, Brynhild, Valdora, Tutty, and Thérèse. Ingomar was a fin-keel vessel drawing 17 feet of water, and had a very large sail area. Many people considered that she was much too leniently treated by the handicappers throughout her visit. Bona was thought to be too much of a racer to enter these handicaps on the South Coast, and it is not easy to see how the distinction could be drawn between her and Ingomar. However, not an undue share of first prizes rewarded her in British waters. In Europe she sailed twenty-two races, winning twelve first, four second, and one third prize. The real object of her visit was to race for the Cape May Cup, originally won by Genesta, but it transpired that the trophy (held by His Majesty) could not be found. Taken altogether, this season was Singularly uninteresting and uneventful, the falling off in the open classes being the more remarkable because the measurement rule was producing a good type of vessel. 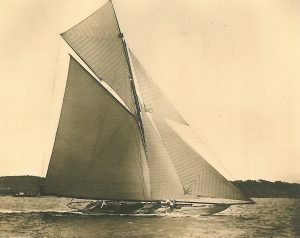 There was no first-class racing this season, the principal open racing being supplied by the 52-footers, two new vessels being built—Britomart, designed by Mr. Alfred Mylne for Mr. W. P. Burton ; and Sonya, designed and built for Mrs. Turner Farley by Messrs. Herreshoff, of Rhode Island, U.S.A. The German Emperor’s Cup race from Dover to Heligoland was started on June 17 under a sealed handicap, and resulted in a victory for Herr O. Holdschinsky’s schooner Susanne, Thérèse taking second prize, Navahoe third, and theschooner Sunshine fourth. Sunshine, Schooner, 117 tons. Mr. A. H. Solomon. White Heather, Brynhild, and Valdora made up the large handi­cap class at the Thames regattas, with Rosamond, Creole, Moonbeam, Betty, and Fiona in a smaller class, but sometimes racing with the larger boats. The out-built 52-footers also raced on handicaps, and yielded very good sport. Moonbeam, Yawl, 67 tons. Mr. C. P. Johnson. a new schooner of 103 tons, designed by Mr. C. E. Nicholson for Mr. Fred Milburn. This fleet reinforced the local resources of the Clyde, and, as the four 52-footers also went north, the Clyde regattas were fairly good. 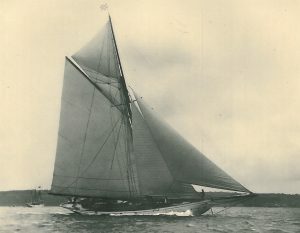 It was, however, otherwise with the Irish fixtures, and the Royal Irish Yacht Club, finding no prospect of securing even a small attendance of racing yachts, abandoned its regatta altogether—the first time in fifty years when the season passed without a first-class regatta at Kingstown. 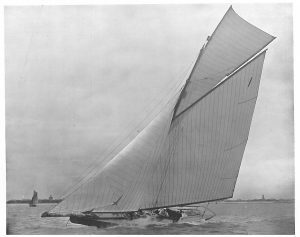 The Clyde clubs presented prizes for a return race from the Clyde to Cowes, which took the vessels clear of Irish ports. The same yachts as raced north started in this match, with the exception of Brynhild, and White Heather repeated her victory. Satanita, Meteor, Brynhild, Cetonia, Cariad, and Sula raced for the Royal Yacht Squadron. King’s Cup, which was won by Cariad on a time allowance of 56 minutes 24 seconds. Seventeen vessels entered for the Emperor’s Cup race, which was won by Mr. Felix Simon’s schooner Thérèse. Brynhild was winner of the Town Cup, and Navahoe won the Squadron Cup on the last day. With so many fine vessels racing, it was generally felt that handicapping was an unsatisfactory method of rendering the matches interesting. Therese, Yawl, 114 tons. Mr. Felix Simon. Throughout the season the 52-foot class made capital racing. Maymon headed the class with 13 first and 11 second prizes out of 36 starts, but Moyana ran her very close with 12 first and 8 second prizes in 35 starts. Britomart, with 6 first and 10 second prizes in 31 starts, had much the same record as Sonya, with 6 first and 7 second prizes in 27 starts. The last-named boat had the largest girth and the smallest d measurement of the fleet, and she was also the shortest on the water-line. She was a very powerful vessel, and hard on her spars, twice losing her mast. 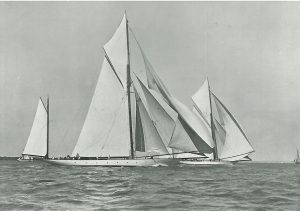 The 36-foot class on the Solent was reinforced by the Clyde boats Falcon (Mr. Leckie) and Maoona (ex Barabel, Mr. Talbot Clifton), and these, with Edie II (Colonel Robin) and Nyama (Mr. Game), made capital sport. Falcon and Maoona proved the best boats of the class. The 24-foot class was strong, Jasmine (Captain R. T. Dixon) being far the most successful. She was a new boat, the first de­signed by Mr. Arthur Payne, son of the celebrated designer of so many yachts. Mrs. Allen’s Su-Su was next to her in number of prizes. The celebrated yacht designer, Mr. G. L. Watson, died this year. 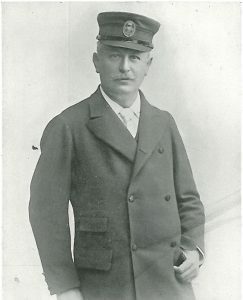 Although famous throughout the world as the designer of racing yachts, he was no less conspicuously successful in later years in the planning of the largest steam yachts as yet built. The arrangement of fixtures was altered this season, with the result that the opening took place with the Clyde regattas. 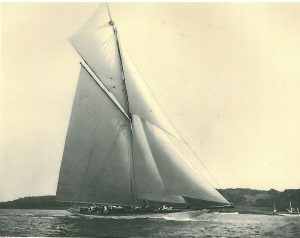 The Royal London Yacht Club again offered a prize for a race from Cowes to the Clyde, which was won by Merrymaid. 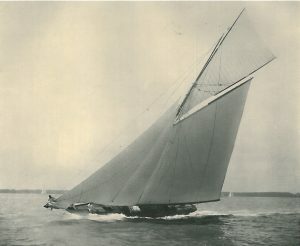 During the winter Mr. Robert Young had a new cutter of 8o rating, named Nyria, designed by Mr. C. E. Nicholson, and although she was extremely heavily built and classed at Lloyd’s, she and White Heather (83 rating) were raced throughout the season with Sir James Pender’s Kariad (95 rating). White Heather was built as a fast cruiser, and was also classed at Lloyd’s. These two yachts proved far more successful than Kariad, in spite of their heavy construction, Nyria in particular showing a remarkable turn of speed. On a 40-mile course Kariad allowed White Heather minutes 16 seconds, and Nyria 13 minutes 57 seconds, accord­ing to the Yacht Racing Association’s time-scale, under which they generally raced. The races between Nyria and White Heather were extremely close, being frequently won by seconds only; but Kariad was very unsuccessful, and also had bad luck. Her rig was altered to that of a yawl later in the season, but this did not put her on equal terms with the other two. Nyria started 29 times, winning 16 first and 4 second prizes, whilst White Heather started 30 times, and won 11 first and 7 second prizes. Kariad’s record was 1 first, 4 second, and 1 third in 21 races. At the end of the season Sir James Pender gave an order to Mr. C. E. Nicholson to design a new racer, and Kariad was abandoned, to be broken up. 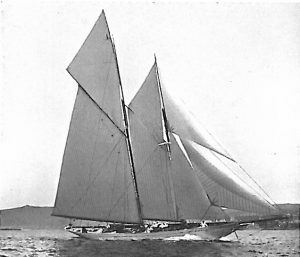 The 52-foot class was composed of Britomart, Moyana, and Sonya. The last named was very unlucky, being frequently in trouble with the jaws of her gaff. The racing in the class was excellent, forty-five races being sailed in less than twelve weeks. Of these, Britomart was always—as in the case of his other yachts —sailed by her owner, Mr. W. P. Burton, and won twenty-one of these matches. Moyana (also sailed by her owner) won sixteen first prizes, and Sonya eight first prizes and eleven second. In the early part of the year an event took place which formed an epoch in the history of European yachting. The Yacht Racing Association succeeded in forming an International Conference, at which every country in Europe agreed to adopt the same rule of measurement, and also to build to rules of scantling which were framed later in the year. The rule is somewhat too intricate to include in this work, but it is not a very wide departure from that which it superseded. The principal objects were to increase internal accommodation and to discourage the flare and long over­hang of the bow. Sail area is also much more lightly taxed by it than heretofore, and a premium is put upon freeboard. The classes were fixed as follows, the measurement being in metres: 5, 6, 7, 8, 10, 12, 15, 19, 23 and over. There is no time allow­ance and no allowance for inferiority of rig in any class except the largest. Two new 23-metre cutters were at once laid down, one for Sir James Pender, Bart., designed by Mr. C. E. Nicholson, and one for Mr. Myles B. Kennedy, designed by Mr. W. Fife. Two new 15-metre yachts were also ordered, Mr. Talbot Clifton having one designed by Mr. Alfred Mylne, and Mr. Yates one from Mr.W. Fife. The 52-foot class was granted another season under the old rule, but the three owners most sportingly agreed to admit the new vessels with a time allowance to be fixed later by the Yacht Racing Association. The settlement of the International Rating Rule brings us to a period in the history of British yachting, and leaves us with high hopes of the future. The talent of our designers and the skill of our builders has never been so marked, and the sport, which, now for the first time for many years, has been put on a sound basis, will afford ample scope for the display of these qualities. It is to be deplored, however, that the United States of America declined to take part in the proceedings, but preferred to adopt a measurement which produces a totally different type of vessel, thus rendering international racing in the future as little likely to be a true test of progress as it has proved in the past. Download a pdf of this Chapter or read on … Chapter 12 – Early Yachting in Scotland.